„Man in Nature“, ca. 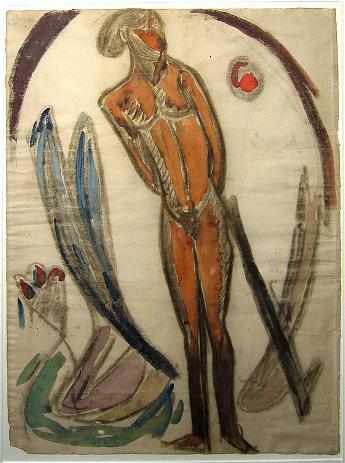 1920, watercolor and charcoal on paper. In this watercolor painting attributed to Willy Robert Huth, he is artistically very close to the expressionist works of Erich Heckel. Huth must have seen Heckels paintings and his work „Lebensstufen“, 1922-1924 in Erfurt. The watercolor painting was acquired from an estate in Erfurt in the early 1990ies. Willi Robert Huth was born in 1890 in Erfurt. He started his studies at the school of applied arts and crafts in Erfurt and Duesseldorf. 1915-1918 he served as soldier and was held in British imprisonment where he met the artist Thomas Ring (see works of him in the section „Abstraction“). In 1919 he started out as independent painter in Berlin and became friend with Karl Schmidt-Rottluff, Erich Heckel, H.M. Pechstein and George Grosz. He married the painter and designer Martel Schwichtenberg in the same year. He joined the expressionist group „Jung Erfurt“ in 1919 (see works of the other members Willy Kirch and Alfred Hanf) . Together with Hermann Sandkuhl, Huth was founding member of the 1921 „Juryfreie Kunstausstellung“ (jury free exhibition). For the „Kestner Society“ Hannover, he designed 6 lithographs for the annual Kestner portfolio. Other artists of this famous print series were Karl Schmidt-Rottluff, Max Kaus, Martel Schwichtenberg, László Moholy-Nagy and El Lissitky. Together with Lyonell Feininger, Paul Klee, Erich Heckel, Otto Mueller, Heinrich Nauen Emil Nolde, H.M. Pechstein Christian Rohlfs and Karl Schmidt-Rottluff he was featured at the „1. deutsche Expressionistenschau“ (First German Expressionists exhibition) at „The Andersen Art Galleries“, New York in 1923. He travelled to Italy, Spain, Austria, Switzerland and Paris and devloped his new, non-expressionist style. With the beginning of the Nazi regime Huth was suppressed as artist. Later on he even received an exhibition ban. Three of his works were confiscated during the „degenerate art movement“. In 1944 Huth was recruited as border patrol and was captured by Russian troops. While away, his studio in Berlin was bombed and all of his works were destroyed. After the war he became an art teacher and later on Professor at the academy of applied art in Berlin. Huth died in 1977 in Amrum.